Sonic Revolution 2014 is less than three months away, and more news has come in! 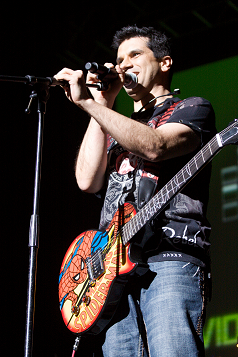 We’re proud to announce that composer Tommy Tallarico of Video Games Live fame will be a special guest at our event. Mr. Tallarico will be talking about his work with Sonic music (he was one of the contributors to Sonic and the Black Knight’s soundtrack) as well as video game music in general. The audience will be more than welcome to ask him questions! We’ve also taken a note from Summer of Sonic and have created a webpage made just for this year’s event! Give it a look sometime! Saw him in person once outside of VGL, at a fairly small Q&A session at my university about a year ago...in which he actually put down Sonic. He also randomly made fun of me before the event started. I was sitting in the audience and he pointed in my general direction and said something along the lines of "Look at that guy's Disney shirt!" I was wearing a Star Wars shirt at the time, and it took me a moment to realize he was in fact referring to me. Rather embarrassing, really, but it's the only celebrity story I have. I'm sure he didn't mean anything by it! It's not uncommon for people to play bully other people - it's meant as a a joke and isn't supposed to hurt someone's feelings. Johnny Gioeli of Crush 40 makes some smart remarks from time to time as well, though he's a pretty swell dude overall! Mr. Tallarico insulting Sonic is perfectly normal; a lot of other Sonic fans do it too. Self-deprecation is just something a lot of fans are fond of (understandably).